In the digital age we're not afraid to take pictures and photograph things because we can always delete it! But I still have old photos which are not so successful to say the least and it really bother me that I can't do anything with them. When I say unsuccessful I also mean blurry photos but mostly un scrapable photos. Those photos which don't tell any story, which have unwanted people in the background or not so nice facial expressions. The photos where somebody else took for me and I wish I didn't ask because they are too close or too far or not what I wanted...you get the picture. 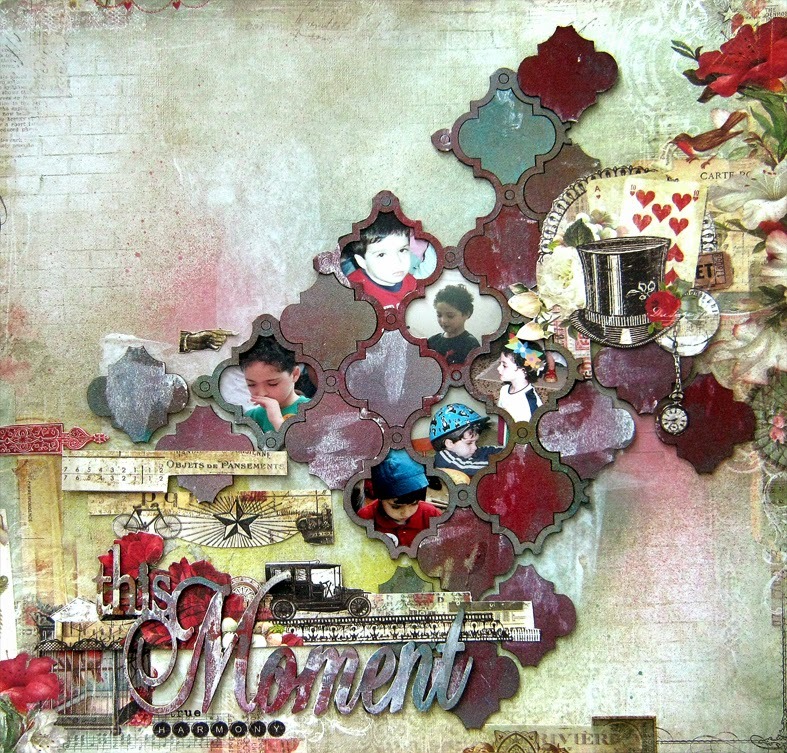 The first layout is a collage. Many small photos I cut from the original photo. I cut the faces that were lost in the noisy background or were too far to see. 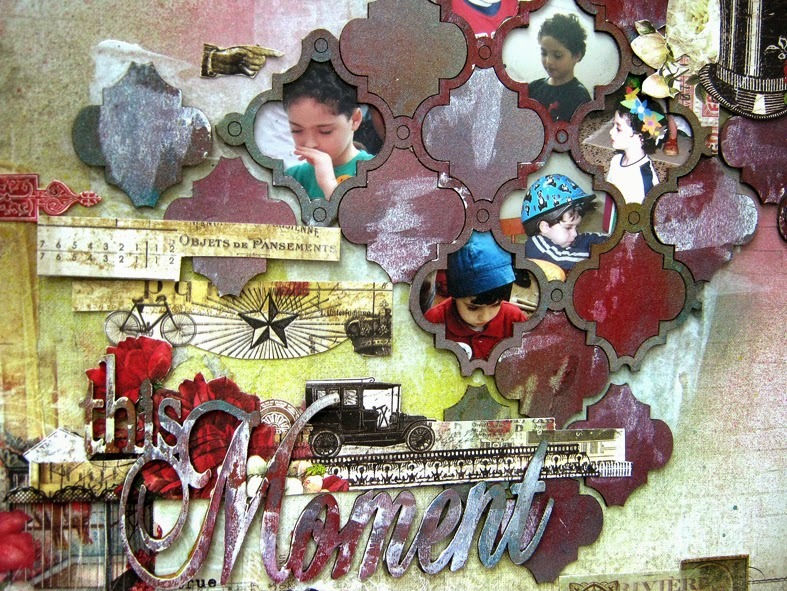 I used Blue Fern Studios' Marrakech Panel to create a grid to house the small photos. I sprayed the chipboard with several colors and added a little white gesso and then separated the inner pieces. I arranged the grid, the inner pieces and the pre cut photos on the page and just added a few cut pieces from patterned paper. You can watch a step by step video tutorial that I created for Blue Fern Studios to check out how I created this layout. Just click here. 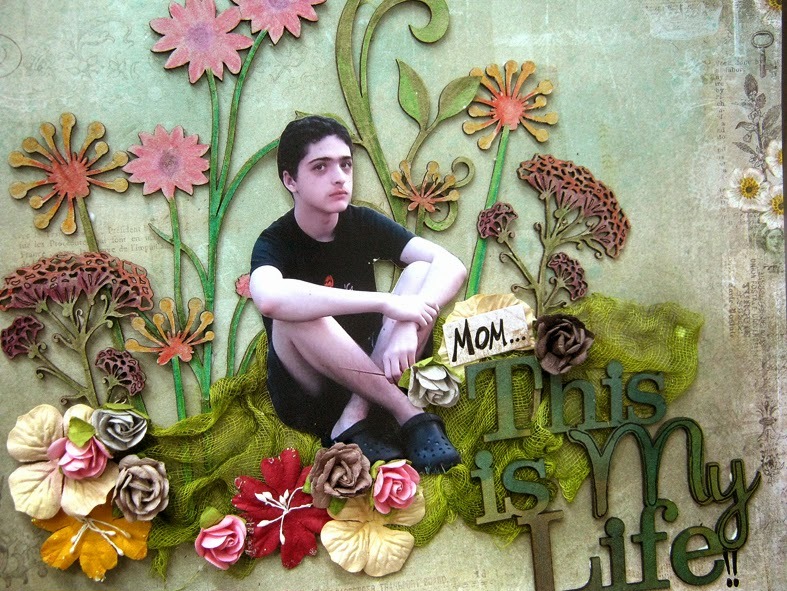 For the second layout I used a cut image of my son which I cut out of the photo. I always wanted to use this photo but he always seemed to angry in the photo and I didn't know how to work with that. 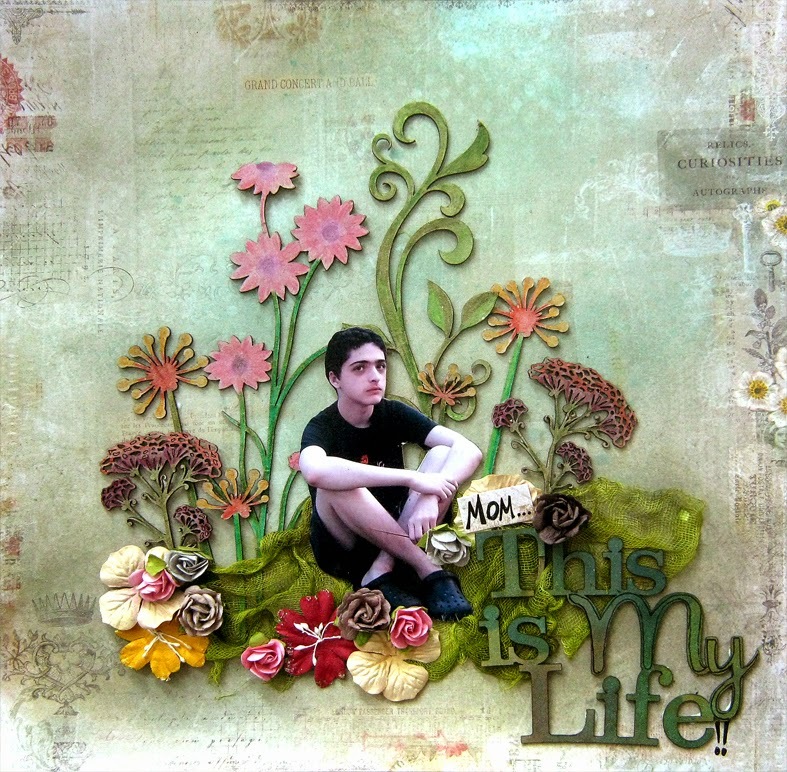 The idea I had was to use "This is my Life" chipboard by BFS and add something to it. So the title became: "Mom...this is my life!" which fits that angry face. For the flower garden I used flower chipboards by BFS and colored them with Aquarelle pencils and a water brush. Then I "planted" them in the sprayed cheesecloth I used as grass/flower bed. I also added some paper flowers to have a rich garden fit for spring. I hope this has inspired you to challenge yourself to use your not so successful photos. Which ones would you use first? Follow me on Facebook and YouTube for more crafty treats!Have Fun Creating!